Brendan Rodgers' lack of experience has been laid bare yet again - and it's time for Liverpool to call on Juergen Klopp, says Paul Parker. Liverpool's entire ethos was wrong in their FA Cup semi-final. Yes, Steven Gerrard is leaving, but to make that the focus was a huge mistake, and it's one that Brendan Rodgers walked right into. When you get sentimental in football, you get nothing back. It's a viewpoint I know a lot of Liverpool fans share: the important thing wasn't how the Reds got to the FA Cup final, it was the fact that they did. And by going with Gerrard they lost sight of that, and ended up paying the price - because right now he's a player who takes more away from the team than he brings. Liverpool have looked a far more energetic team without Gerrard this season - and crucially, Jordan Henderson is able to bring a lot more when he's not hobbled by playing alongside the outgoing veteran. A lot of players evolve and develop new elements to their game as they get older - but not Gerrard. He's stayed exactly as he always was, and while Liverpool will miss certain aspects of his game when he heads to LA they will essentially be much better off moving on without him. That's something that Rodgers completely failed to appreciate at the weekend - then again, it's no more than we could expect from a manager whose lack of experience has been cruelly laid bare this season. After the excitement of the last campaign it was always going to be tough to follow it up, and all the changes in tactics and personnel haven't helped the Reds' cause. But when they moved to three at the back and went on their unbeaten run at the start of 2015, it looked like they'd cracked it. They were conceding less, looking better going forward, and even goalie Simon Mignolet stopped dropping so many clangers - though that was probably due to having fewer shots come his way. But one big defeat, by Manchester United, and they have been thrown completely, once again looking desperate and confused. It should have been a mere blip; instead Rodgers is floundering again. I've seen it suggested that Rodgers is in a similar position to Alex Ferguson in his first few years at Manchester United, after they came second in the league in 1988 then struggled the year after. Ferguson came to United as a huge success, a man who'd broken through the Rangers and Celtic grip on Scottish football at a time when Scottish football was still to be feared. He had won a European trophy, and managed his country at a World Cup. He was tasked with turning a social club into a football club, changing the hard-living off-pitch culture - led by the likes of Paul McGrath and Norman Whiteside - and making them winners. He worked slowly, making sure replacements were bedded in before getting rid of the old guard. By comparison, Rodgers is a complete novice at the top level. He'd never worked with top players before - something that is far harder now, given how much they earn - and failed to grasp that the biggest priority having made it into the Champions League was to retain that spot the season afterwards. That will almost certainly not happen now. Worst of all was his efforts in the transfer market. The club's American owners sent him to buy some Hugo Boss suits - but he came back with some from Primark. And an empty wallet to boot. Where does that leave Liverpool now? Well, there's no doubt that they like Rodgers, and in some senses would love to give him another season. But that would be a sentimental choice - and John Henry's board, unlike Rodgers, will not make the mistake of letting sentiment dictate their choices. And all the more so because of one key fact: the availability of Juergen Klopp. There are maybe four or five managers in the world who Liverpool must drop everything for, and Klopp is pretty much top of the list. We're not talking about a man who has thrived at a Real Madrid when given £300 million to spend - we're talking about a man who knows what it is to run a club whose fans boil over with passion every weekend. 80,000 fans pack out the stands at Borussia Dortmund for every match, and Liverpool are one of the few clubs whose atmosphere could hope to rival that. Klopp walked into that situation and worked a miracle by reawakening the sleeping giant - exactly the sort of feat Liverpool need now. He knows how to turn things around, how to earn the respect and devotion of his players, how to mix it with the very best sides in the world. In short, it's hard to imagine a better fit for Liverpool. As much as they might feel inclined to keep faith with Rodgers, the club's owners will be even more inclined to go all-out for quick success. I guarantee that if there are 10 people sitting in the boardroom at Fenway, five will be shouting to get Klopp on the phone - and the other five will know that if they resist and Rodgers fails again next season, they'll be the ones to blame for getting in the way of the deal. Klopp's phone is probably already ringing off the hook - just this morning I heard West Ham have made him an offer, and while that was never going to happen it does just show that things will happen quickly. 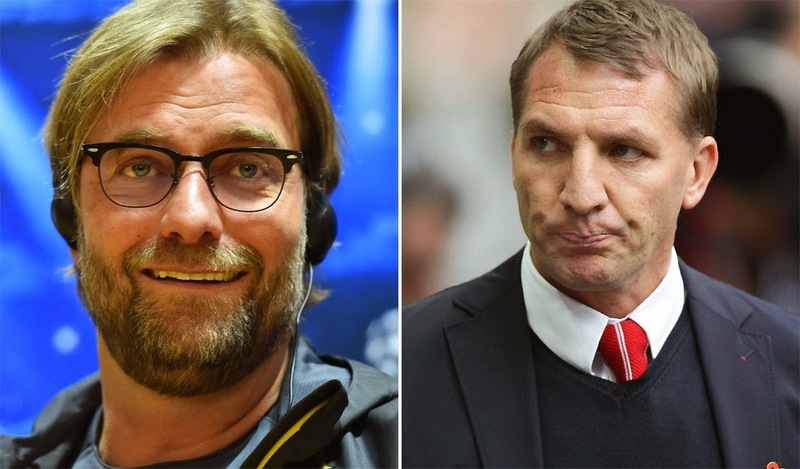 So Liverpool must act fast; if they let this chance go, they'll be left kicking themselves.